Can I Substitute Rolled Oats for Flour in Cookies? What Is the Difference in Bleached & Unbleached All-Purpose Flour When Baking? 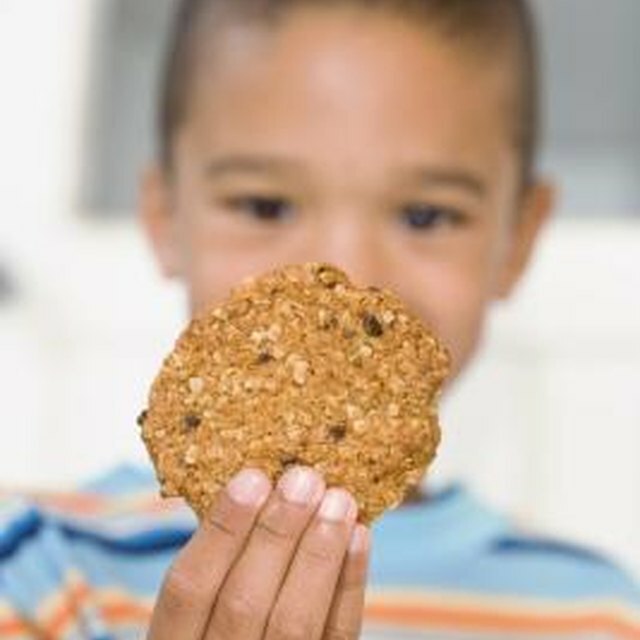 1 Can I Substitute Rolled Oats for Flour in Cookies? 2 How Many Calories are in Pistachio Muffins? 4 What Is the Difference in Bleached & Unbleached All-Purpose Flour When Baking? Muffin recipes typically call for all-purpose flour. While this is readily available in local grocery stores, there may come a time you cannot use all-purpose flour in your recipe. The flour in muffins adds volume; therefore, some substitutes might create a denser muffin than others. Rolled oats are rolled into flat flakes, steamed and then lightly toasted. They offer a nutty taste and coarse texture. You can use oats in place of flour in your muffin recipes by using 1 cup of oats for every 1 cup of all-purpose flour. Since oats have no leavening capabilities, you may need to add more baking powder or baking soda. Try 1 to 2 teaspoons of leavener per 1 cup of oats. Your muffins may have a gummier texture than if you used flour. Wheat germ, which is made from the edible part of a wheat kernel, has a dry, flour-like consistency. It’s rich in nutrients, including potassium and iron, and has a good deal of protein, too. You cannot substitute wheat germ for all of the all-purpose flour in muffins, but you can replace up to a third of the total amount of flour with it. For example, for every 1 cup of flour called for in the recipe, use 2/3 cup all-purpose flour and 1/3 cup wheat germ. For those who need a gluten-free muffin, you can use non-wheat flours instead of wheat-based flours. All-purpose gluten-free flour mixes are available in most grocery stores and health food stores, and they are used in equal proportion to all-purpose wheat flour. You can also use ¾ cup rice flour and 2 ½ teaspoons of baking powder for every 1 cup of all-purpose flour. Your muffins will have a crumbly texture, because rice flour absorbs moisture faster than all-purpose flour. Other non-wheat flours can also be used, but these require a mixture of non-wheat and wheat flours; therefore, they are not recommended for gluten-free recipes. If you’re not making a gluten-free muffin, mix in ¼ cup soy flour plus ¾ cup white flour for every 1 cup all-purpose flour. Cake flour can be used in place of all-purpose flour, but because it has a lighter texture you’ll need to use 1 cup and 2 tablespoons of cake flour for every 1 cup of all-purpose flour. Self-rising flour can be used cup for cup in your recipes, but you’ll need to omit your leavening agents and salt from the muffin recipe. Other wheat flours produce a similar texture to all-purpose flour. Can I Use Rolled Oats in Place of Millet Flour in Bread? Does Cake Flour Contain Baking Soda & Salt? Can You Make Cupcake Mix Without Baking Soda?